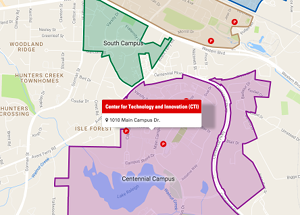 The Geospatial Information Science and Technology (GIST) program at NC State consists of a fully online master’s program and a graduate certificate in Geospatial Information Science (GIS). The programs provide students with the education and skills necessary to succeed as a geospatial professional. DELTA staff worked to create marketing materials for both GIST programs to achieve the recruitment goals and increase enrollments. The marketing materials produced by the DELTA team included a passport-sized booklet with information on both the online master’s and graduate certificate, a branded carabiner giveaway and a small table-top banner display for use at career fairs. Reach target audiences who include prospective students in the GIS class at NC State, college fair attendees and visitors to the Center for Geospatial Analytics who may be interested in the online GIST program. Provide visibility and engagement at prominent GIS-related conferences. Increase applications for the program. Create a voice for the program and build awareness of the program based on its needs. The marketing materials focused on highlighting GIST as a unique program with a wide reach in audience and as an efficient program that provides career advancement. The DELTA marketing team performed a historical analysis of enrollments and looked at the past performance of the program in developing GIST’s marketing materials. An analysis of target audiences and their needs was also conducted. By understanding the target audience of the GIST program, the DELTA marketing team was able to identify their needs and create the best methods and materials to reach them. The passport size booklet included testimonials from a current student in the online GIS Graduate Certificate program who resides in Hawaii and a graduate of the online GIST master’s program who resides in Asheville, N.C. Two items were created specifically for student recruitment: a branded carabiner giveaway and a small table-top banner display. These key materials were created for the GIST programs to easily distribute and reach potential applicants looking for NC State’s unique program. Visit NCSUGeospatial on Facebook and @NCSUGeospatial on Twitter for more information about these programs. For more information about DELTA services, please contact LearnTech.